This Townhouse Is Perfect For Families Or Friends. Unit has internet access. Stowe VT is the quintessential New England town. This townhouse is located just 30 minutes south of Burlington, and 30 minutes north of Montpelier. Six miles to Mount Mansfield and only a mile from the village of Stowe. Ski trolley to Mountain is available across the street at the Stoweflake Resort. Enjoy hiking, golfing, walking, biking and skiing, downhill and cross country. Walk to new Alchemist Brewery home of the Heady Topper Beer. Enjoy Stowe at its finest. This town house features 3 bedrooms, pull out couch, two full baths, a fully equipped kitchen, gas fireplace, pull out couch and room for 8. The award winning community has a game room for the kids, an indoor pool, a sauna and hot tub. Well maintained, pack your gear and head on up. We have been traveling to Stowe for over 30 years and believe Stowe is one of the top all season locations in New England. We love the great outdoors and Stowe provides nature's beauty in abundance as well as loads of out door things to do from walking and biking on the nearby recreation path, golfing on the adjacent golf course, to hiking and skiing and much more. This townhouse is perfectly placed between the village and the mountain, surrounded by shops and restaurants in either direction. We welcome other travelers to enjoy the home we have come to love so much. Walking distance to award winning Stowe Flake Resort and a bus ride away from the new SPA and Resort at the mountain. Lots of parking - two in front of unit! Fully Equipped - pots/pans, serving for up to 8! Pick up the shuttle next door at the Stowe Flake Resort - only a few miles from the mountain. Very good place to stay with a family. It is in good shape and close to everything. The location is great, a 15-minute ride to Stowe. And for the area, the price is reasonable. There are a few restaurants in the immediate area and a nice propane fireplane in the unit. That being said, the facilities could use some updating. The wallpaper was peeling off in some of the rooms. The mattresses and pillows were incredibly uncomfortable. One king bed and everything else was twins so not ideal for multiple couple's. The unit is crazy hot at night and there's a sign to leave the heat above 70 due to concern for pipes freezing. Check in was a little confusing. We got there kind of late, were told the keys would be at the unit. We found our unit and my name was taped to an empty envelope. Que several minutes of panicking until we confirmed with the owner that we could just pick up the keys in the morning. We might stay there again due to location/price alone and maybe bring a better pillow. We had a nice relaxing time in Stowe. The condo was well-appointed and clean, the beds very comfortable. The condo was well-heated (if anything, too well - there was a note not to turn it down below 70F for fear of freezing, and at night we like it colder) - and the fireplace made it all more comfy. The only thing I hope they fix (and I made the recommendation to the owner) is to get a new shower head in the second (guest) bathroom - the stream was a dribble which led to a cold and unpleasant experience. Thanks, shower head has been replaced. First time renting through this site and wasn’t quite sure what to expect. Property was very clean and had everything you would need. Very spacious especially all the bedrooms. Very relaxing...Beautiful views of the golf course. My family had a great time and we would definitely come back! Great! We are very happy you enjoyed your stay. Hope you come back again soon. We enjoyed our stay here. 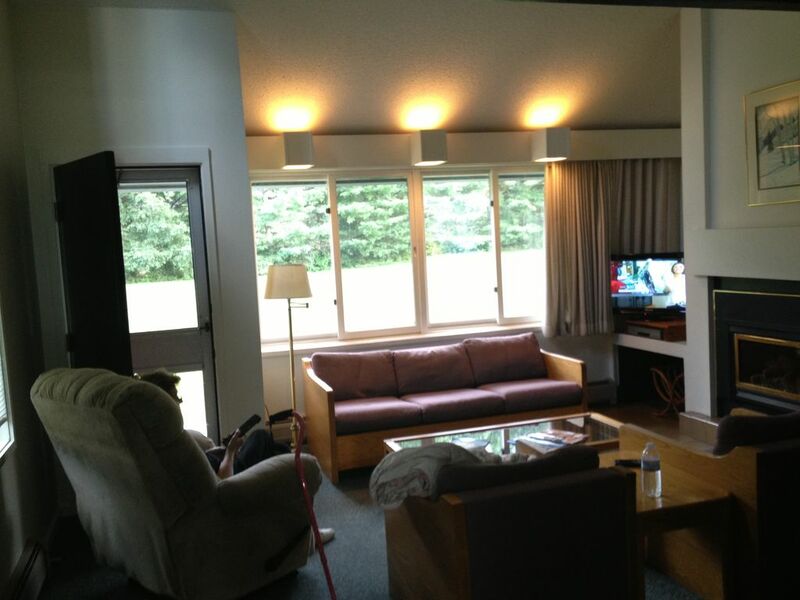 Our family group of 4 adults had room to spread out and the condo provided everything we needed. The location is quiet (living room and master bedroom windows face the golf course) but provided easy access to Mountain Road and the restaurants and shops. We were lucky to visit during the hot air balloon festival which was right across the street. We also drove to see a jazz guitarist (John Pizzarelli) performance at the Spruce Peak Performing Arts Center which was great. Bruce, the owner, was pleasant to deal with and communicated promptly. The reception desk gentleman at the office on Saturday morning was very nice and gave us good information about golf opportunities and events in the area. The kitchen was well equipped with utensils. I will say the beds were a little hard but we were able to deal with it. We do hope to rent this condo again. We have stayed at Village Green before and we have always enjoye the property.